Biff Tannen: "What are you looking at butthead?!" Mr. Strickland: "You've got a real attitude problem, McFly. You're a slacker!" Marty McFly: "Wait a minute, wait a minute Doc. Are you telling me that you built a time machine out of a DeLorean?" 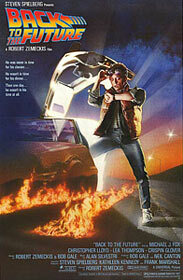 Doc Brown: "The way I see it, if you're gonna build a time machine into a car, why not do it with some style?"